Lacock itself dates back to the 13th century and has remained largely unchanged over the centuries with its many lime washed, half-timbered and stone buildings. 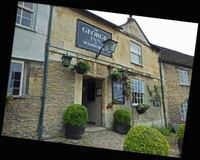 One of those buildings, The George Inn, established circa 1361 has an amazing history and is famous for its medieval open fire place with a dog wheel that you can see in the top left of the photo. The little dog used to run inside the wheel to turn the very large spit you see in the fireplace to the left. The food is excellent and the service friendly.